Rava Masala idli is spicy and delicious. It is an easy way to make regular plain idlies interesting, they are not only for breakfast but they are absolutely wonderful for snack. Rava masala idli batter is made by mixing Rava (sooji, cream of wheat) with yogurt and red chili, curry leaves, cashews, urad and chana dal and mustard seeds and asafetida tadka is added to the batter to make the idlis spicy and flavorful, then this batter is steamed in Idli making molds. 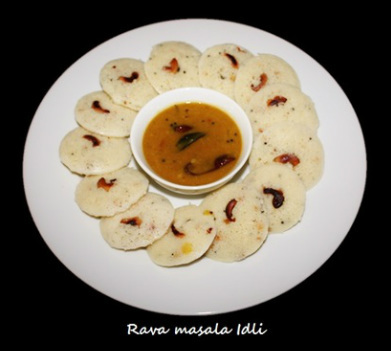 Rava idlis are soft fluffy and very tempting to look at they taste great with sambhar and coconut chutney. Masala rava idli is easy and quick to prepare then traditional rice and lentils idlis, because the idli batter does not require overnight fermentation. 1. Idly stand - Stand has 4 plates stacked over each other. 1. Soak Chana Dal and Urad Dal in water. constantly. Do not brown the rava. 3. Add 2 tablespoons of oil and mix it well with rava. 4. Transfer the rava into a bowl and add salt and mix. 5. In a cup add yogurt and beat it with the spoon until it become smooth. 6. Pour the yogurt over the rava and mix it well. 8. Cover the bowl and keep it in a warm place to ferment for 2 to 3 hour or longer. 9. Once batter is fermented and you are ready to make idli's prepare seasoning. 10. Heat 1 tablespoon of oil in a frying pan on medium heat, add cashews and fry them until they are golden brown. keep them aside. minutes or until mustard seed start splattering. the consistency of the batter should be thick. 14. Now prepare the steamer for steaming the idlis. 15. In a large pot or idly cooker add about 1” of water and bring it to boil. 16. Grease the idly trays with a drop of oil and rub it around. 17. Put fried cashew nuts in the center of each Idli mold. 19. With a spoon drop some batter on the idly maker trays, do not fill it up to the top leave some room for them to expand. 20. Stack the idli trays in the stand. 21. When stacking the idly maker trays alter the holes of idly stand, the tray wholes should not be right on the top of another. 22. Immediately place the idly maker stand in the pot or idly cooker, with boiling water, close the lid of the cooker or cover the pot. 23. In about 7 to 8 minutes cooker will start steaming, then let the idli's cook for 7 to 8 minutes, turn the heat off. If steaming idlis in the pot then after steam start coming let them cook for 10 to 12 minutes. 24. Open the idli cooker and take a tooth pick and insert in an idli to see if they are cooked, if the tooth pick come out clean it means idli is cooked. Take the idli stand out of the idli cooker or the pot. 25. Let the idli's cool down, then take a butter knife or a plastic knife and insert in the edges of idli and loose them up, then insert the knife under the idli and take it out from the stand. Repeat until you take all the idly out. 26. Clean the idly maker and grease it, before you make other batch of idli. 27. Serve the idly's with sambhar and coconut chutney. 2. The idli batter has to be fermented otherwise you won’t get good Idly's.